a special layout today of gorgeous twins: Kate and Rose, daughters of our dear friends: Genevieve and Hugh. 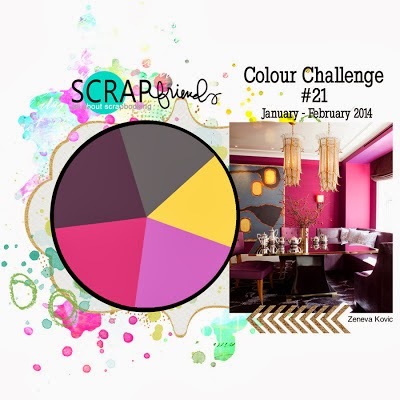 I used the color palette of my favorite challenge: Scrapfriends. I had the puzzle pieces for a long time on my desk and decided to play with them on this layout. I think, it's a unique addition to the embellishments. Experimenting...that's what I like mostly about the scrapbooking, hahaha! this layout is about my daughter (2.5), who taught me a parenting lesson. I had to figure it out how to deal with her strong will ("my way or no way"): patience! She taught me patience and how to balanced my and her emotions. To find the answer how to deal with this little person, I read some excellent books like "Happy Kids and patient Parents" or "Carry On, Warrior". My daughter changed me and I have to than her for that! The sketch is based on Once upon a sketch challenge: we are supposed to use in the journalling: Theme-"Lesson learnt..."
Thanks in advance for your sweet comments!